We receive many enquiries from individuals all over the UK who ask for advice on how to become an arborist / tree surgeon, and what is involved. 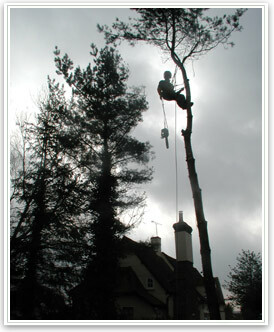 It may also be interesting for our customers too to read a little about what a career in arb or tree surgery involves. What follows is a some information on this matter which should help you understand the various routes into the tree surgery industry and what a job in arb involves. Essentially there are two routes to becoming an arborist - there are no short-cuts really, it does require training (See our recommended book lists for useful arb training & tree surgery books). One route in is by finding a job with a local tree surgery business, and starting as a trainee tree surgeon/arborist. Generally you will start as a groundsman, a highly skilled job in itself and also physically demanding. It may take months even years as a groundsman before starting to climb. You will first need to be become proficient in the use of chainsaws on the ground and be put through the necessary NPTC chainsaw certificates. It could be that your personal circumstances or current employment give you the flexibility to offer your services as a volunteer. You may be able to get valuable experience with a tree surgery company for a day or two a week or more. This will certainly appeal to many tree surgery businesses who would see this as an opportunity to increase their numbers on certain jobs at little expense. However for the prospective tree surgeon this is an excellent opportunity to get involved in the industry and get some real 'on the job' experience. It may also lead to a job if you prove that you are a 'grafter', or at least give you some contacts in the industry. A word of caution - Do some research into who you are offering your services to. Just because someone is in the Yellow Pages or has a website does not mean that they are a bona fida tree surgery company. Satisfy yourself that they operate a sound and safe business. If you do volunteer for a company and you find yourself in a clearly unsafe 'cowboy' operation, don't be afraid to walk away. You can also put this down to experience! Don't get killed. The other route to becoming an arborist is to go to a specialist arb college where you can learn the necessary tree surgery skills and gain the qualifications required to be a tree surgeon. See our list at bottom of page. You will be taught a broad range of tree surgery skills and theory to give you a good grounding in arboriculture. 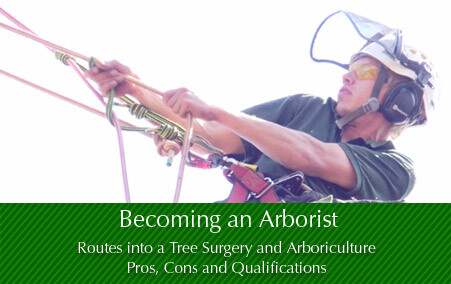 You will be starting with a view to becoming an arborist, not just a tree surgeon. Your learning will be up to date and you will enter the mind-set of the modern arb industry. A lot has changed in even the last 5 years. If you go back 20 years it is almost un-recognisable. Having qualifications does not necessarily mean you are a good tree surgeon, it will still take many years of 'on the job' work to learn how to be a good arborist in a commercial environment. What you learn at college doesn't necessarily equip you to deal with the physical demands and ability to work on all trees. This takes time and experience. There will be times, often daily to begin with, when you will need to push yourself and overcome fear and tiredness. On the whole Tree Surgery is a young persons 'game'. By the age of, say 35, you are old in tree surgery terms, or at least to start. That is not to say that people don't start successful careers in tree surgery at this age or after, only be under no illusion that perhaps when you are 45 you may not want to be climbing trees anymore. 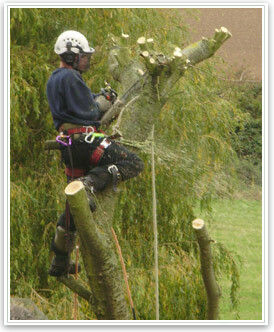 There are many excellent tree surgeons that are 'older', sometimes the best. But it is likely that they started young and have learnt early. Bear this in mind if you are thinking of coming into tree surgery and you are 30 or over. It goes without saying that climbing trees with a chainsaw can be a dangerous occupation. Safety precautions, risk assessments, protective clothing, comprehensive training e.t.c. is essential to minimise risk, but accidents do and can happen. There are safer and easier ways to earn money! The NPTC chainsaw qualifications below are recognised in the HSE guidance as being the appropriate qualification route for professional chainsaw users. As a rough cost guide for each of the above NPTC tree surgery courses is in the region of £350 - £550, depending on who you train with, and which level you are doing. The cost of taking a the certificate and gaining the qualification is usually additonal to the course. All 5 of the above NPTC qualifications (or equivalent LANTRA Awards) are the minimum legal and industry standards for carrying out tree surgery work with a chainsaw in a tree. There are other recognised qualifications called LANTRA Awards. 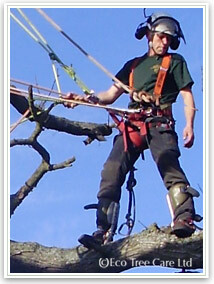 See also http://www.hse.gov.uk/pubns/afag805.pdf for details on training and certification requirements for Tree Surgery. Being legally allowed to wield a chainsaw on the ground or up a tree does not necessarily make you a a good arborist. You have to have an understanding and knowledge of trees and respect them as living organisms. You must know where, when and how to cut a tree, and, perhaps more importantly when, where and how not to cut a tree and when just to leave it alone. You must know how different tree species react to different pruning techniques, which trees will die if pruned too hard, what season to prune which trees and why. Equipped with this knowledge and then applying it means you can call yourself an arborist. See below for a discussion of the difference between a tree surgeon and an arborist. I have not met a tree surgeon who does not love the job & love being outside. Despite all the above negative points and the details of the stringient certification required (designed to discourage the faint-hearted, who would only be wasting their time), tree surgery has a high degree of job satisfaction. It has to have this, and you have to enjoy it, otherwise you just wouldn't bother doing it. It does take a particular type of person to do this sort of work, it is difficult to exactly say what this is, and I am not going to attempt to. I have tried to give you an idea of what is involved, only you will know yourself if tree surgery is something that you would and could do. Good Luck. I have compiled this "Jobs in Tree Surgery" web page as an aid to those wishing to start a career in tree surgery (and to save me time in answering daily emails), but it is by no means exhaustive. As the whole arboriculture field is always changing, some information may become incorrect or incomplete. If you find any mistakes or think something should be added then please email me and let me know, or if you have any comments good, bad or don't agree I would also like to know. Some people have found the "Jobs in Tree Surgery" page so useful that they have asked to be able to donate a small amount. These donations do help me to keep the page updated, fresh and relevant. Sometimes people want to email or call for specific questions or to ask for further advice in which case a donation would be much appreciated if you would like me to personally answer your queries and give more specific advice. It all helps me feed my family. Arborist or Tree Surgeon - Discuss? 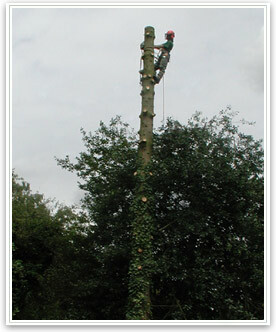 There is a tendency to use the term tree surgeon and tree surgery interchangeably with arborist and arboriculture. It should be noted that there is a strong movement in the profession to move away from using the terms tree surgeon and tree surgery to describe what we do. An arborist is used to refer to someone who has a knowledge of trees as living organisms, understands when, how and why to perform pruning. An arborist, as well as knowledge of trees and how they grow, will also have the skills necessary to operate a chainsaw, climb the tree safely and carry out the pruning operations. The distinction being that anyone who climbs a tree with a chainsaw and cuts 'bits' off can and do call themselves a tree surgeon. The bits that are cut off may not necessarily be the correct bits. They may not even be cut off a tree that the 'tree surgeon' even knows what the tree is, let alone how it will respond to pruning. Within the profession of arboriculture, tree surgeon is increasingly being used to refer to cowboy operators and tree surgery to the work that they carry out. Having said this, the public at large may very well have never heard the terms 'arborist' or 'arboriculture' and still use the old terms. On the internet and in general marketing many professional arborists and arboricultural businesses will, for this reason, still have to refer to themselves using the terms tree surgeon and tree surgery. Following on from this then, it is up to all in the profession to help re-educate the public to understand that arboriculture is a profession which specifically deals with the care of trees, and an arborist is a professional who carries this out. Over time these terms will increasingly be used and understood. NPTC certificates, tree surgery, woodland management e.t.c. Firmly established in the arb world 'Tree Life' offer top class courses across the country. However please note they teach the management and theory of arboriculture, rather than the pratical tree surgery techniques and chainsaws. See the colleges list below for courses specific to practical tree surgery,. Both Dave Dowson & Andy Summerley have decades of experience in arboriculture and are excellent at communicating this knowledge to their students. They are independant from the colleges and have an excellent examination pass rate. Well worth booking on a course with them if you can. Tree Life Head Office and Training Centre. Badger Hill Training & Assessment Centre Ltd.
BHTAC provides nationwide tree surgery training and independent assessment for all NPTC tree surgery qualifications in one complete package. Training and assessment on your site or ours. For further details contact Luke Fisher or Jenny Abraham. PLS Training provides a range of Tree surgery , Arboriculture and Forestry courses working towards Lantra and NPTC Assessment. 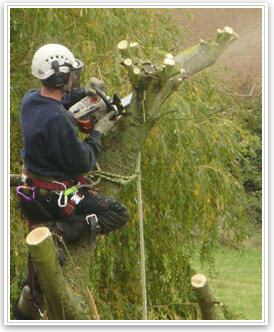 Qualified and experienced in all aspects of Arboriculture (Tree Surgery) and Forestry skills. Registered NPTC Assessor and Lantra Instructor/Training Provider. All courses are carried out in managed woodlands and parks throughout the East Midlands. 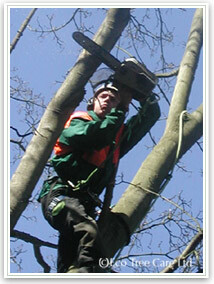 For further details please contact Phil Smith to discuss your tree surgery training requirements. 7Y is a leading land-based skills training provider, specialising in NPTC machinery and tree surgery operations, chainsaw and pesticides. In addition we have our own fork lift training centre, covering Industrial Masted & Telescopic, Bobcat and other types of Skid Steer Loaders, ATVs and Plant. (A long established, Lantra registered training organisation. Non profit-making. Adequate training is a vital aspect of your risk assessment so to be sure your are within the law. Please contact Sue Oakley (Administrator) or Nick Cartwright (Course Tutor) for further details on tree surgery and other courses and an application form. Ian Gower Associaties Ltd is a new company with experienced, established trainers specialising in a wide range of training inervations in amenity horticulture. NPTC qualifications offered include Safe Use of Pesticides, Chainsaw, Arboricultural Operations, Tree Surgery, Turf Maintenance Equipment, Brushcutting Operations, Landscape Plant Machinery and the Safe Use of Mowers. Registered Instructor No. KINA 04. 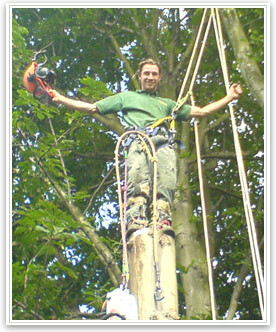 Capel Manor College is London's leading provider of tree surgery, land-based training and assessment. In addition to offering a range of full-time and part-time courses we are a training provider and assessment centre for all Tree Surgery NPTC Chainsaw and Arboricultural Operation Units and Pesticide Application Units. Contact Amanda in Student Administration for full details. 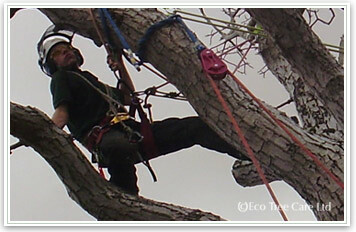 Providers of True tree based tree surgery skills, offering both LANTRA and NPTC certified courses. Our emphasis is on delivering best Forestry and Arboriculture practice and tree surgery training at an affordable price. All courses are delivered by competent, qualified and industrially experienced trainers. Easton College, Norfolk's college of the countryside, offers a wide range of bespoke tree surgery training designed to suit land-based industry needs. In addition, the college is a training provider and assessment centre for NPTC units such as chainsaws, tree surgery arboricultural operations, pesticides, forklift truck operations and much more. For more information contact the Professional Training Centre. Moulton College has an unrivalled reputation for excellence in training for the Land Based Industries and Tree Surgery. Set in the rolling countryside of rural Northamptonshire, it is the ideal place to enjoy your course. Assessments can be carried out for all the NPTC Certificates of Competence for Chainsaw & Related Operations subject to site availability. Scottish Agricultural Colleges training services include short tailored courses specific to particular interests including Tree Surgery Courses. For more information contact Kay Forsyth at the above. SAC have 24 regional offices located throughout Scotland as follows: Aberdeen, Ayr, Benbecula, Campbeltown, Cupar, Dumfries, Edinburgh, Elgin, Forfar, Inverness, Inverurie, Kirkwall, Lanark, Lerwick, Oban, Perth, Portree, St. Boswells, Stirling, Stonehaven, Stornoway, Stranraer, Thurso and Turriff. Barony College situated in South West Scotland, 10 miles from Dumfries specialises in training and education for the land-based, tree surgery and animal care industries. BTS Training offer a wide based, comprehensive range of Arboricultural Nationally Accredited courses and Assessments including all aspects of Health and Safety training for both the professional and the occasional tree worker, from climber to groundsman. 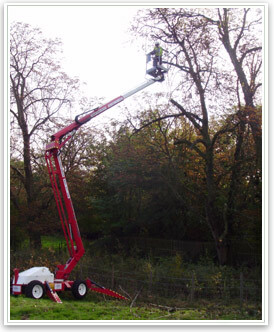 TKF Training is one of the country's leading independent tree surgery training providers delivering training to leading utilities, local authorities and private clients throughout Great Britain and Eastern Europe. As an NPTC Assessment Centre specialising in tree surgery, forestry, arboriculture, utility arboriculture and pesticide training TKF Training is ideally placed to administer the full range of Tree Surgery NPTC Awards. Training courses can be delivered at our purpose built training centre situated within a 350 acre commercial woodland near the popular market town of Holmfirth or on your own site. Specialist Training Provider in NPTC Pesticide Application modules PA1, PA2, PA4, PA6A, PA6AW, PA6B, PA9, PA11. Other modules are available on request. Operating nationwide and provides a complete training and assessment package. Training is also available in Machinery Operations, Livestock Production, Chain Saws and Tree Surgery Arboricultural Operations.